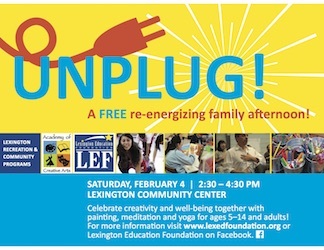 Lexington Houses Blog: UNPLUG! A Re-Energizing Family Afternoon in Lexington! UNPLUG! A Re-Energizing Family Afternoon in Lexington! Lexington Recreation & Community Programs, Lexington Education Foundation and the Academy of Creative Arts are excited to invite children ages 5-14 and adults to a complimentary Re-Energizing Afternoon! UNPLUG! A Re-Energizing Family Afternoon! Celebrate creativity and well-being together with painting, meditation and yoga. FREE advance sign-up enters you to win a gift certificate from Catch A Falling Star! Bring your family for painting, meditation, and yoga, plus raffles for Rancatore's and refreshments! The event is FREE to families and activities are on-going throughout the afternoon. FREE family event. Sponsored by the Lexington Education Foundation, the Town of Lexington Recreation and Community Programs and the Academy of Creative Arts.